The higher the temperature rises, the lower your ambition to cook a hot meal at home. The solution? Cool, crisp summer salads. Crisp greens, crunchy vegetables and tasty proteins join forces to feed your summer activities without forcing you to spend a lot of time in the kitchen. When made properly, a salad can serve as your entire entree. Add crusty bread on the side to round out the meal. Not sure what to do with your leafy greens? We have plenty of summer salad recipe ideas to keep you excited about eating. Use the recipes as inspiration to create your own salad recipes this summer. For reference, one head of iceberg or romaine lettuce makes approximately 10 cups of prepared lettuce. One pound of spinach is roughly 12 cups of prepared spinach. As quick as summer salad recipes are to throw together, they can still seem like work when what you really want to do is enjoy your summer days. Doing a little prep work can get you eating faster, so you have a healthy option on hand. Prep the ingredients ahead of time. Whether you are making summer salads for a crowd or just for yourself, prepping the individual ingredients ahead of time makes it easy to pull together the finished salad right before serving. Wash and dry your selected lettuce leaves. Wash, dry and chop any veggies you plan to use. Cook and chop meat. Just before guests arrive — or before you plan to eat — assemble the salad. Make individual salads in a jar. If you are making salads for yourself or your family, layer the ingredients in a mason jar. The salad is ready to go for a quick lunch on the go or dinner after a long day of running errands. Start with the dressing in the bottom. Add a layer of hearty vegetables, such as tomatoes or cucumbers, directly on the salad dressing. These veggies hold up well sitting in the salad dressing for several days. Add the rest of the veggies, your selected protein and cheese. Always put your lettuce on top to keep it from getting soggy. When you are ready to eat, shake up the jar to distribute the dressing, and your salad is ready. Mix and match your salads. Getting bored with the same summer salads? Take some creative liberties with the ingredients you use — it is difficult to mess up a salad. Replace chicken in a recipe with salmon. Try a different type of dressing than you normally use on your salad. Use arugula instead of romaine, or try another type of green base for the salad. Test out grilled vegetables instead of raw veggies. You may end up creating an amazing salad you never would have found. Grill your proteins. By moving the cooking portion outdoors, you keep your kitchen cool and comfortable so you can enjoy your salad without breaking a sweat. If you prefer to cook your protein inside, cook in bulk at the beginning of the week so you have protein for your salads all week long. Take the best parts of a BLT sandwich, and turn them into a salad that is both hearty and delicious. The key players in this summer salad are chunks of salty bacon, crunchy croutons and deep red tomatoes. A bed of romaine lettuce gives this salad a cool, crisp base without overpowering the BLT components. The buttermilk dressing adds a creamy finish with just a bit of tang. 1. Whisk together the buttermilk, mayonnaise, apple cider vinegar and scallion to make the dressing for the BLT salad. 2. Cook the bacon until it is crispy. Dab off the extra grease. Chop the bacon, and let it cool so it doesn’t wilt your salad. 3. Put the washed and torn romaine lettuce into a serving bowl. 4. Top the lettuce with the tomatoes, onion and bacon. 5. Drizzle the buttermilk dressing on top, and toss the salad to coat the leaves. 6. Top the BLT salad with the croutons. Cut up baguette bread into 1/2 inch cubes to make about 4 cups of cubes. Toss the cubes with 2 tablespoons of olive oil. Sprinkle the cubes with salt and pepper to taste. Spread the cubes on a baking sheet. Bake at 375 degrees for 15 to 20 minutes. Toss the croutons a few times during baking for an even brown. Cool the croutons before adding them to a salad. You can add other herbs and seasonings to customize your croutons. Use them with any of your favorite salad recipes for a fresh-tasting crunch. Capture the beauty of colorful heirloom tomatoes for a light summer salad. This recipe skips the traditional leafy green base and goes straight to the heart of the matter with hearty tomatoes. A healthy salad dressing recipe made of extra-virgin olive oil and balsamic vinegar brings out the flavor of the ingredients. 1. Wash the heirloom tomatoes. Half, quarter or slice the tomatoes depending on the size. 2. Arrange the tomatoes on a large serving platter. Sprinkle the chopped chives and fresh basil over the tomatoes. Sprinkle the tomatoes with the salt and pepper. 3. Whisk together the extra-virgin olive oil and balsamic vinegar. Drizzle the dressing over the tomatoes before serving. Add roasted beets to the tomatoes. Mix Dijon mustard with the dressing. Flavor the salad with additional herbs or seasonings, such as tarragon, capers or garlic. Mix in chopped cooked chicken for protein. Summer and strawberries go together, so it only makes sense to bring that combination to your summer salad menu. If you do not grow your own strawberries, you can easily find the sweet red berries in your grocery store or farmers’ market during the summer months. Combined with the crunch of nuts, creaminess of goat cheese and tang of poppy seed dressing, this salad sends your taste buds on a trip to flavor town. 1. Arrange the washed spinach leaves in a large serving bowl. 2. Add strawberries, onions and avocado pieces. 3. Drizzle the poppy seed salad dressing over the salad mixture and toss to distribute the dressing evenly. 4. Top the salad with the toasted nuts and crumbled goat cheese. Garnish the salad with additional sliced strawberries. Instead of ordering a side salad with your steak, make your steak the star of this summer main dish salad. The addition of beef makes this a hearty salad perfect for meals. It is also a good way to convince the carnivore at the dinner party that salads are delicious. 1. Slice the grilled steak into thin strips. Let the steak cool so it does not wilt the lettuce. 2. 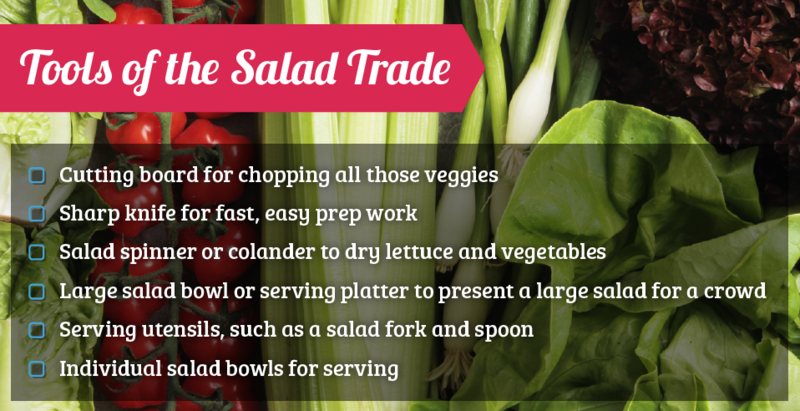 Arrange the washed salad greens in a large serving bowl, or distribute it on individual dinner plates. 3. Top the lettuce with tomatoes and onions. 4. Arrange steak strips on salad. 5. Sprinkle with blue cheese crumbles. 7. Top with fried onions. If you do not feel like a leafy summer salad, this cucumber and tomato option lets you still enjoy fresh summer vegetables without the lettuce. This recipe pairs cool, crisp cucumbers with hearty tomatoes and onions along with other herbs and seasonings. Because it does not use lettuce, this salad does not get soggy quickly, making it the perfect salad to take along for a summer potluck. 1. Whisk together the olive oil, red wine vinegar and oregano. Set aside. 2. Combine the prepared cucumbers, onions, tomatoes and herbs. 3. Toss the vinaigrette dressing with the veggies. 4. Sprinkle on salt and pepper to taste. 5. Top with ½ cup of feta cheese before serving. Just like strawberries, tomatoes are a deep red symbol of the summer months. The classic caprese salad pairs the sweetness of tomatoes with creamy mozzarella, flavorful basil and tangy balsamic vinegar for a rich combination of flavors. This salad looks as good as it tastes, with the carefully stacked layers of red, white and green ingredients. 1. Heat the balsamic vinegar in a saucepan over low heat until it reaches a gentle boil. Continue cooking and stirring occasionally for about 15 minutes or until it reduces to a thick, pourable glaze consistency. Cool the glaze before using. 2. Slice the tomatoes into thick slabs. 4. Remove extra long stems on the basil. 5. Alternate layers of tomato slices, mozzarella slices and basil leaves to cover your serving platter. 6. Drizzle the top of the tomatoes, mozzarella and basil with the balsamic glaze and extra-virgin olive oil. Season the entire dish with salt and pepper to taste. For an alternate presentation, use smaller tomatoes. Cut the tomatoes in half and remove seeds. Chunk up the mozzarella cheese, and put them inside the tomato halves. Drizzle the tops with the same balsamic reduction, olive oil, salt and pepper. Now that you are armed with several new summer salad ideas, it is time to get cooking. Serve up your favorite summer salad for a cool, refreshing meal without spending all day in the kitchen with the help of durable, high-quality serving plates, salad bowls and serving utensils.